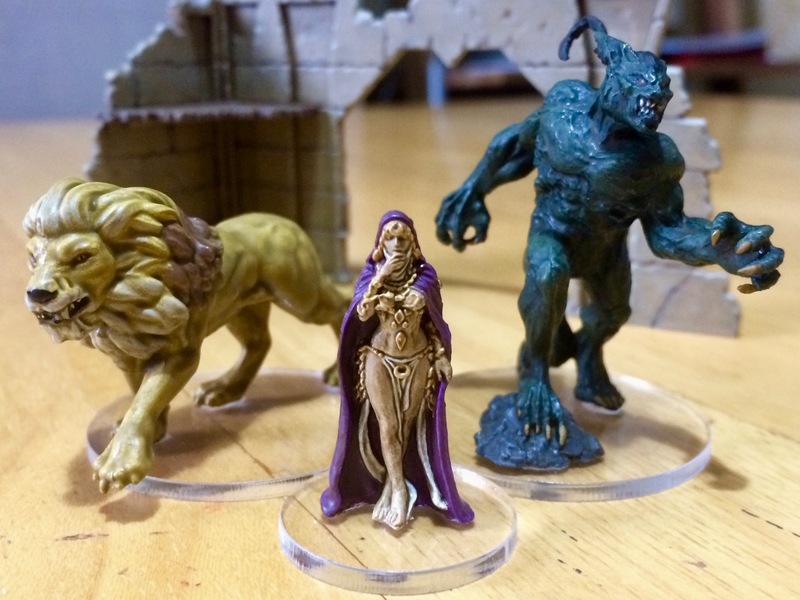 I completed another trio of characters for the Conan board game in the shape of the Princess, Conan’s Lion and the Demon of the Earth. I don’t know yet where they will appear in the storyline, but I felt like painting them and wanted to see the Army Painter results. I used a lighter skin tone on the princess (none of those peasants’ tan for a high born) and chose purple for her cape to emphasise her regal appearance. Note how I also snuck in a ruin from Lord of the Rings that I just painted for use with my Tomb Kings – and possibly Conan if I wanted to go down the 2.5D route. 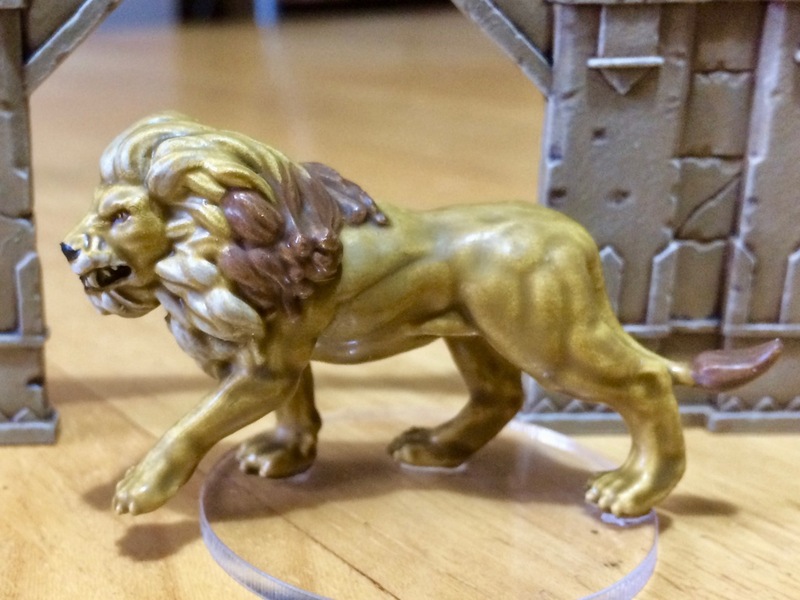 I did an image search on real life lions to find suitable spot colours and patterns for this beast, and once again the soft tone served to blend them all together nicely while also picking out details from the simple sand coloured base coat. For the Demon of the Earth I started with a dark green base coat followed by a mid green drybrush. Since it was going to be all just dark skin, I felt it was going to be necessary to pick up the details from muscles and veins to give it depth. A darker Quickshade would have been more suitable with this colour scheme, but I only have the one pot right now, and I’m sticking with it. For an earthy look it works well enough, and away from the glare of the camera the skin looks less washed out than it appears here. 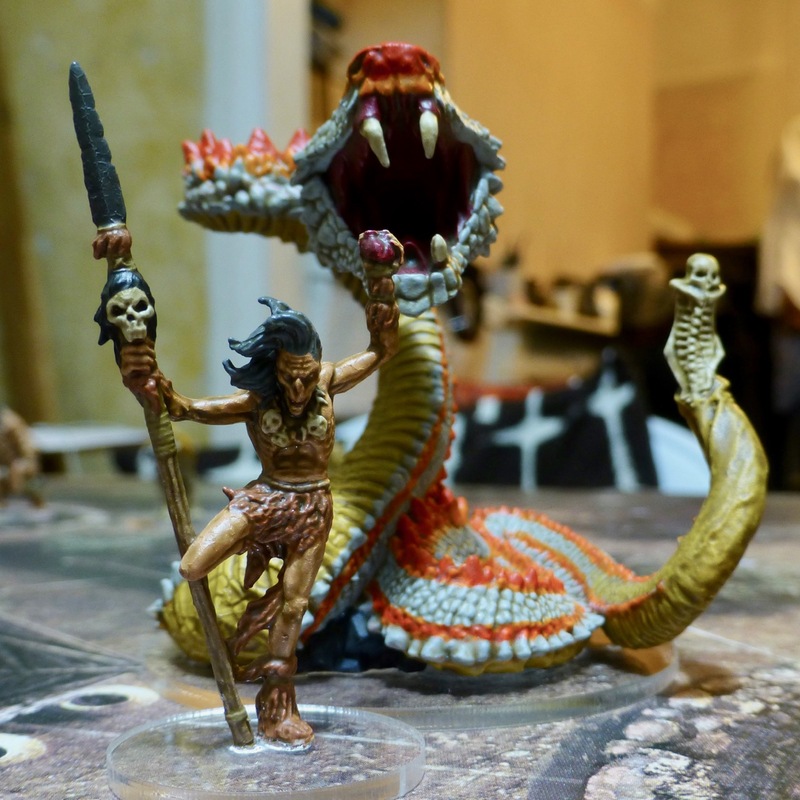 My Conan collection is turning out to be a nice go to when I only have small amounts of time to paint or lack the concentration for detail work. As such, it seems I am painting additional figures instead of not painting at all, and it hasn’t really slowed down other projects. 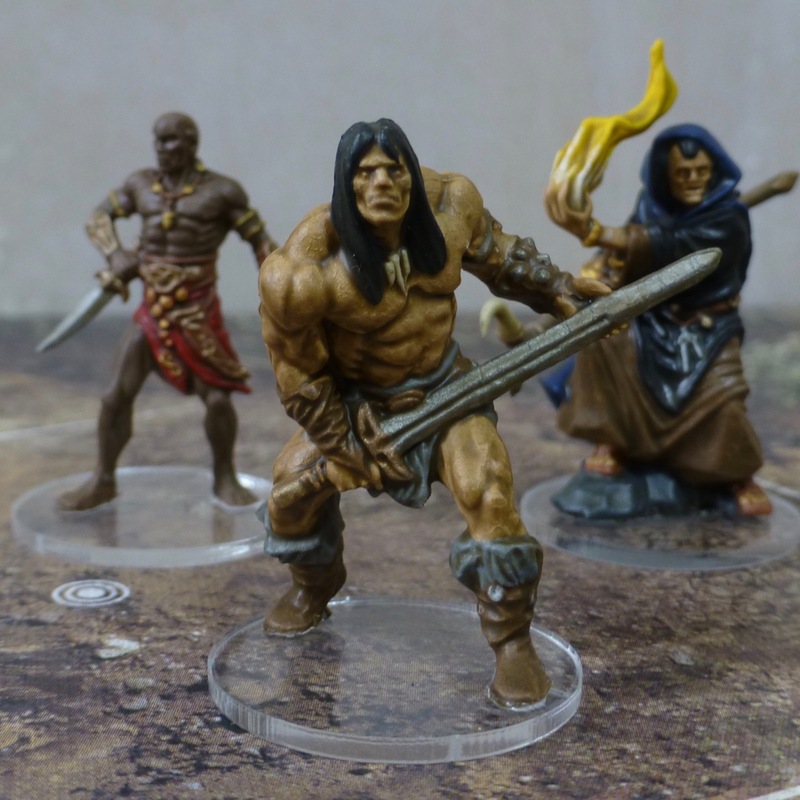 To finish off my initial scenario set for Monolith Edition’s Conan board game, I painted the three hero characters. First up, the man, the legend – Conan the barbarian. It’s a great sculpt, especially the face is really well done. Ideally suited for the Army Painter Quickshade method. 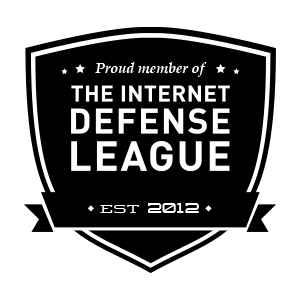 I like the menacing pose as well, ready to leap into action. While the Picts have rather weird, grotesquely muscle bound body shapes, Conan himself looks more realistic – in a Mr Universe sort of way. 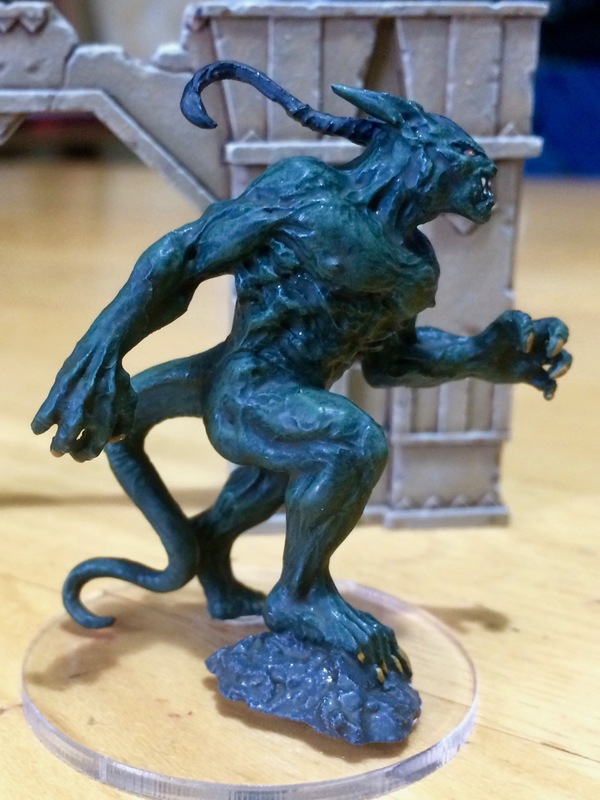 Shevatas the master-thief is an equally well executed miniature, his pose fitting for that of an agile knife fighter. There are some very nice ornate details like on his bracers. I found that the soft tone shade also worked well on his darker skin tone. Hadrathus the priest has been my least favourite figure to paint so far, partly to blame on my choice of technique and colours. 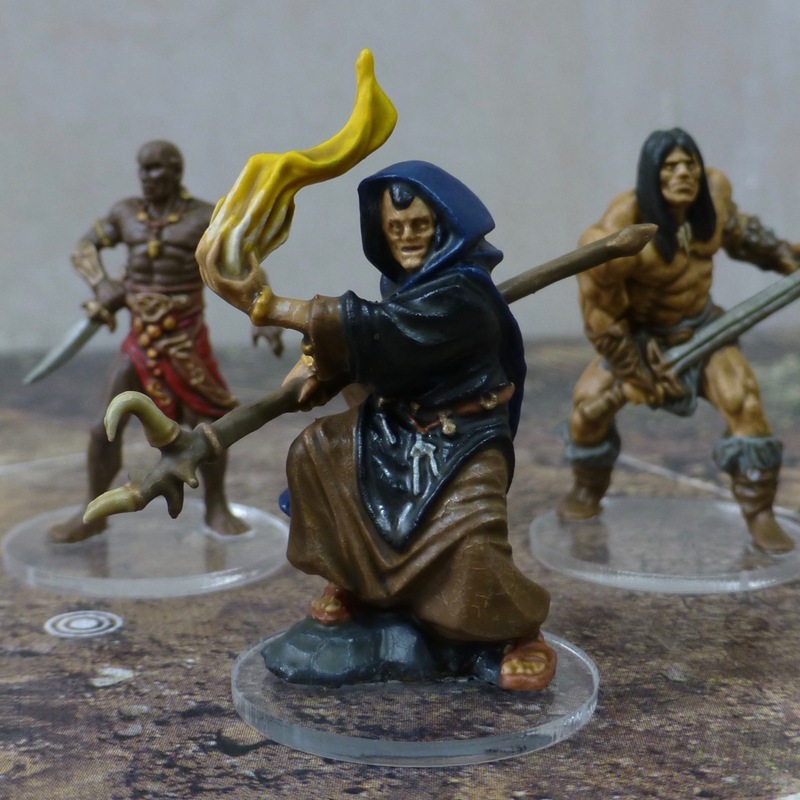 I might rethink the brown robe and paint it in a darker tone, and some areas ended up too shiny. Since taking the photos I have tried to correct this with some success. I found that the shade didn’t really work on the black and blue cloth and I mostly overpainted it with a more traditional black wash. Since our first full game is likely going to be postponed into the new year, I might paint the odd figure for the game until then as the mood strikes me. Next up in terms of narrative would be the pirates, but I’ll probably turn my attention to the undead first. 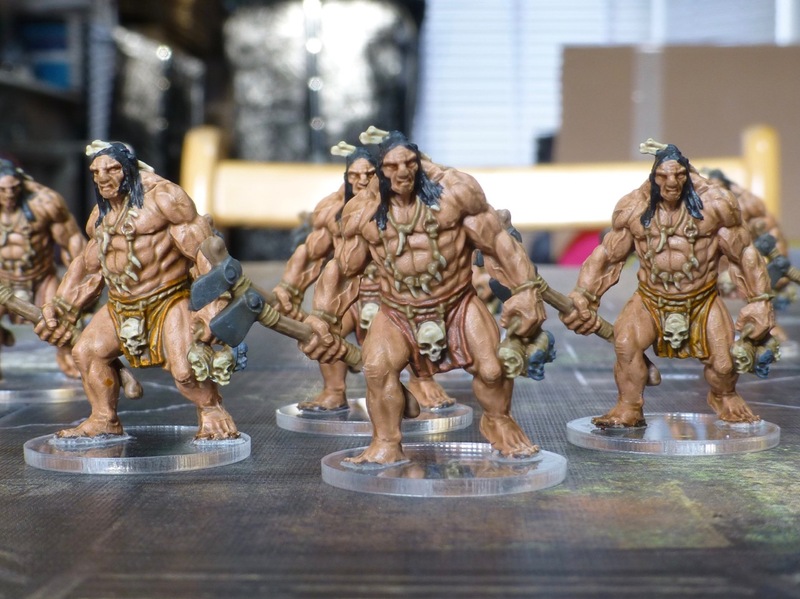 I thought my progress might falter when it came to the larger beasts and characters for Conan, but I seem to have settled into my approach, so the first two were done over a few short painting stints. 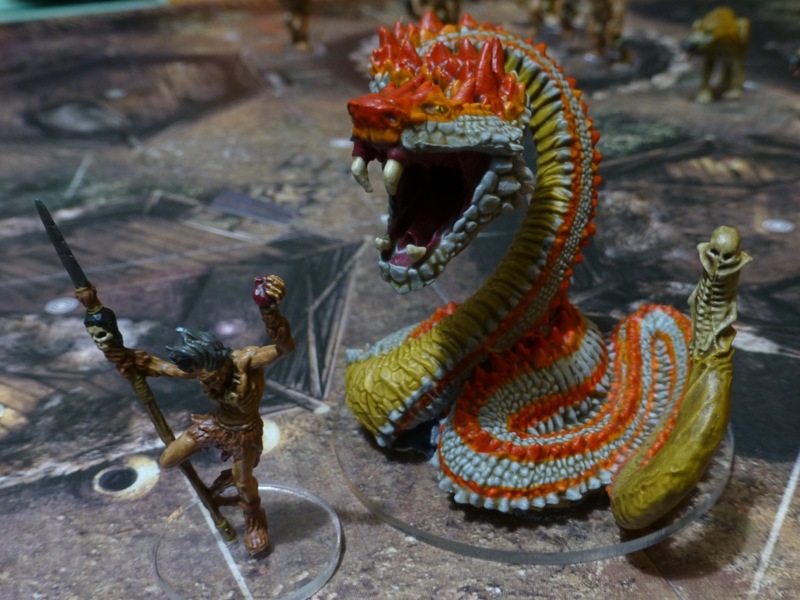 The giant snake was the first of the monsters Monolith showed off, and it really made me take notice. I like monsters but I have very few actually painted. 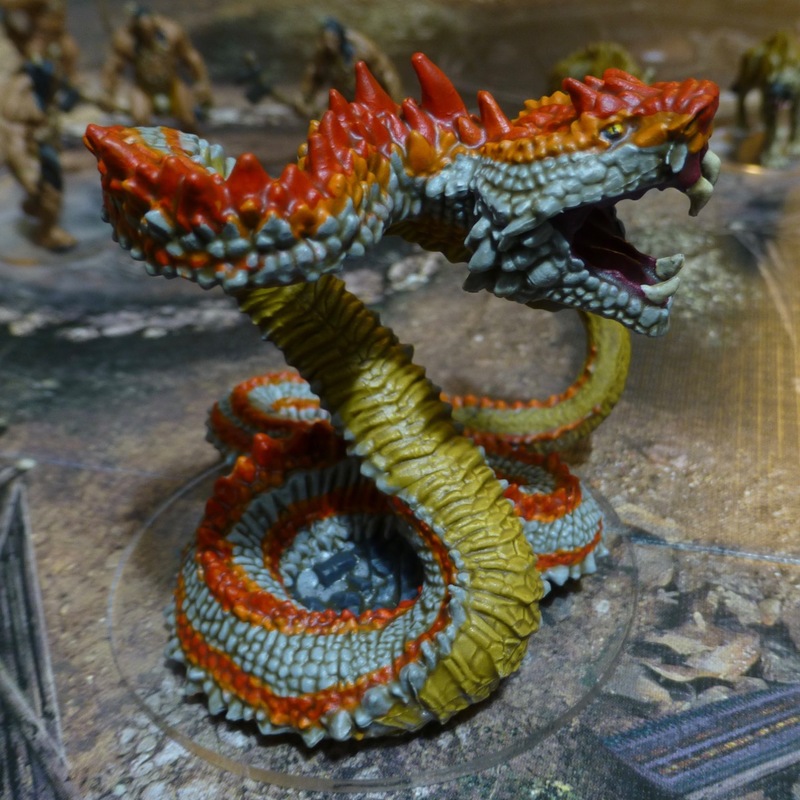 Painting the scales on the giant snake by normal means with individual highlighting would take me ages. I’m sure the results would be brilliant and the sculpt deserves it, but I’m still happy with what I got using a handful of colours and a coat of Army Painter Quickshade. 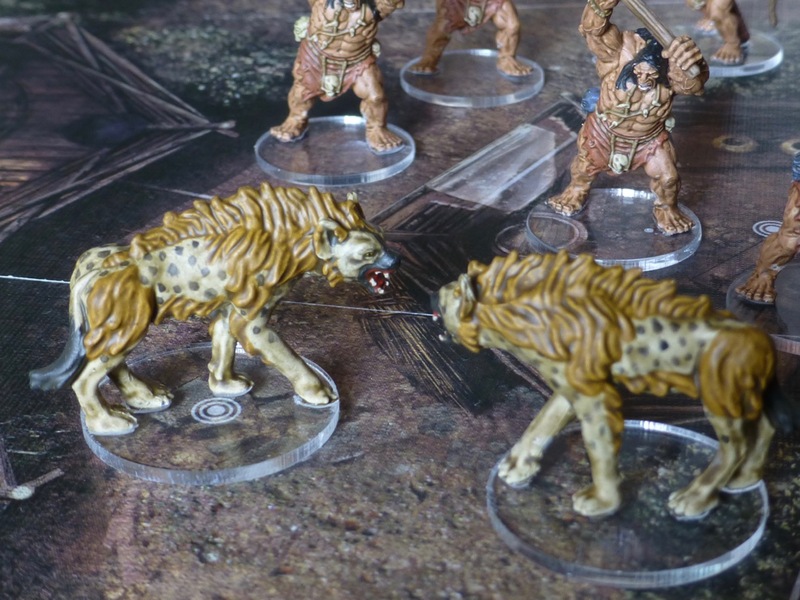 The shaman Zogar Sag was painted using the same colour scheme as his tribesmen. Given his very different physique and theatrical pose he should still stand out from the crowd. The villains are waiting, ready to sacrifice Yselda to their dark god. It is time for the heroes to enter the scene! 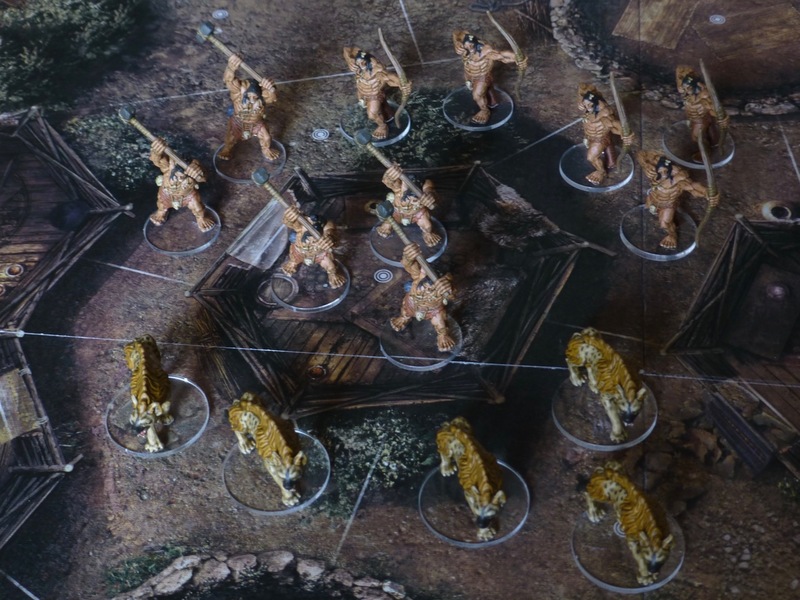 I’ve finished the Pictish tribe for Conan, adding warriors, archers and a pack of hyenas roaming through the village. 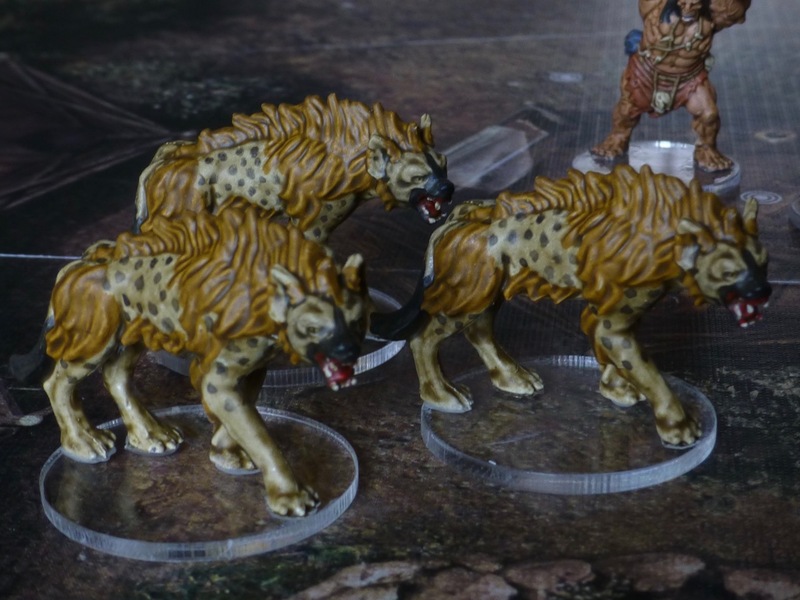 Being satisfied with my first purchase of 25mm bases, I also received my second order of clear bases from Fluid 3D Workshop in different sizes for the various creatures and monsters in the game. Next up it’s the heroes and villains and a big beast. 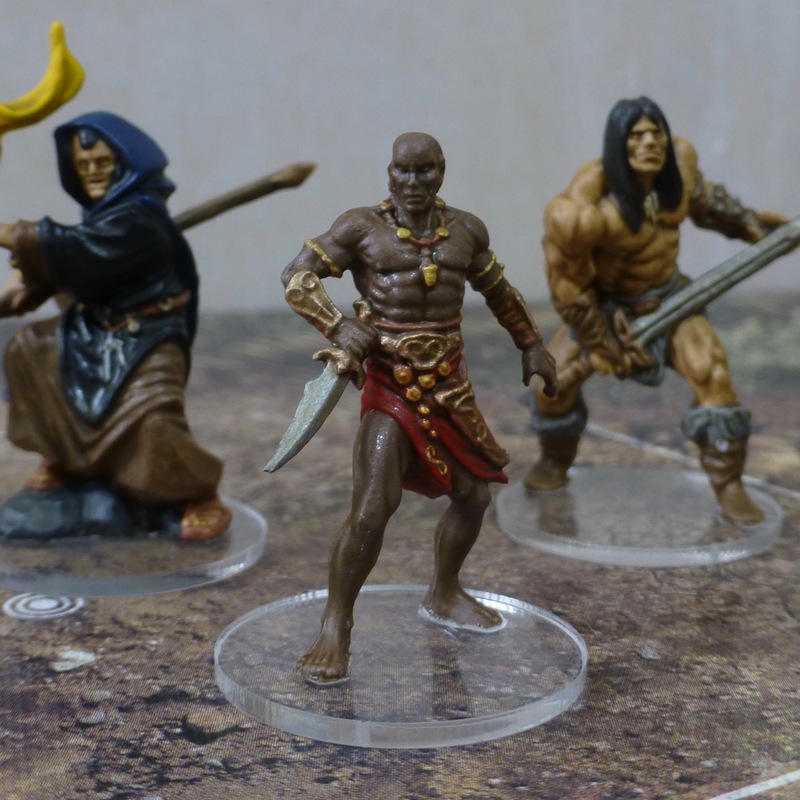 I was one of 16,000 backers who supported the Conan Kickstarter by Monolith, drawn in by the quality of the sculpts, artwork and the sheer volume of loot that was getting unlocked. 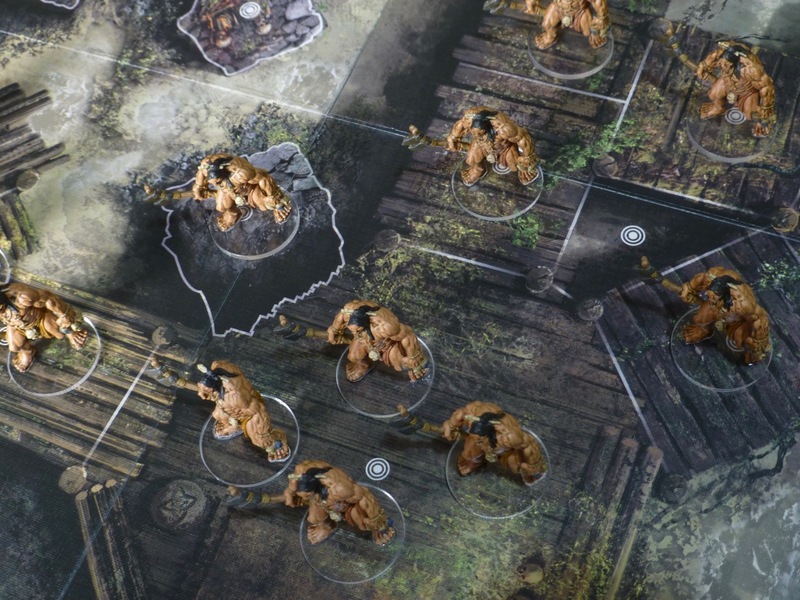 Now I have received my pledge, which is effectively a completely new miniatures hobby game with several factions, all in all well over 100 figures. 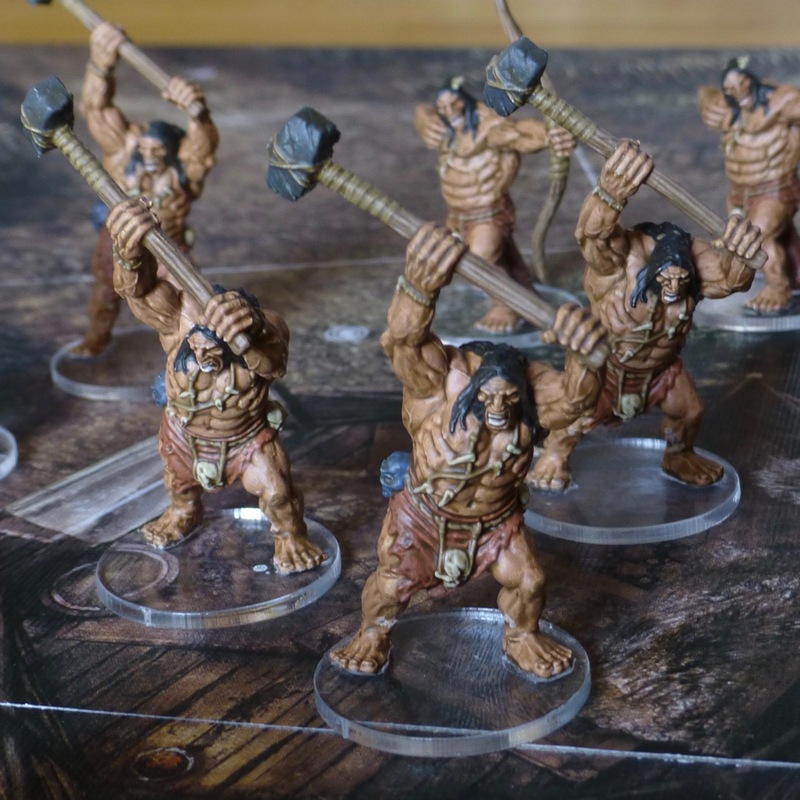 Not painting these is not an option, since the miniatures are one of the main draws of the game, but painting them in my usual way would take at least a year – assuming I was not painting anything else. Therefore I have opted to paint everything in base colours only and then give it the Army Painter Soft Tone Quickshade treatment. I’ve never used this before and I wouldn’t use it for my wargaming projects, but for a board game it is a reasonable/necessary compromise. 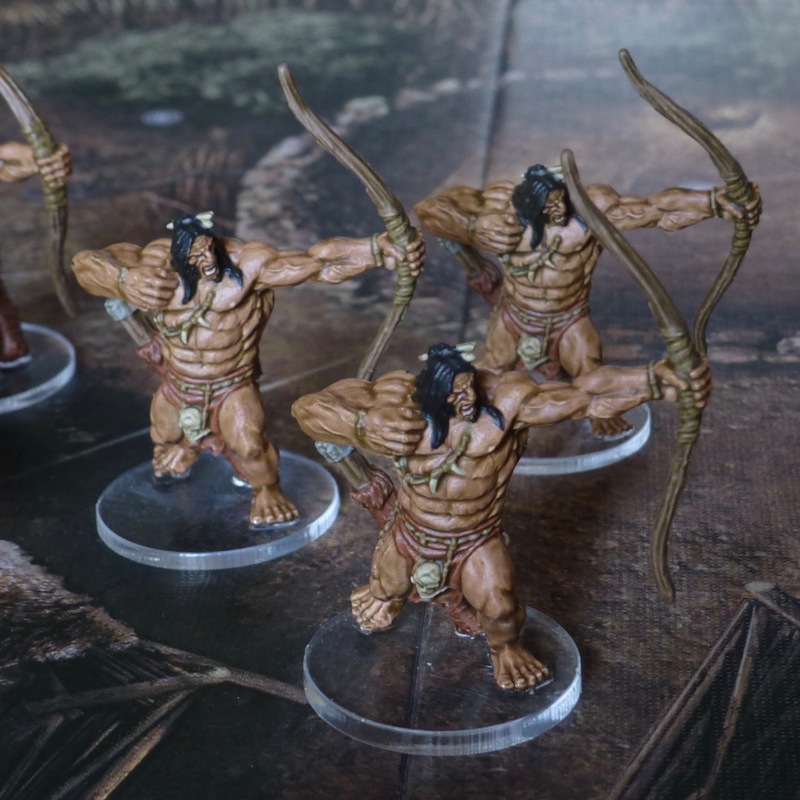 In the first scenario, Conan is going up against the Picts, so I started painting those. I finished the 15 Pict Hunters (all identical sculpts) with 5 Warriors and 5 Archers in the works. The sculpts are very nice, with few mould lines, plenty of detail and character. 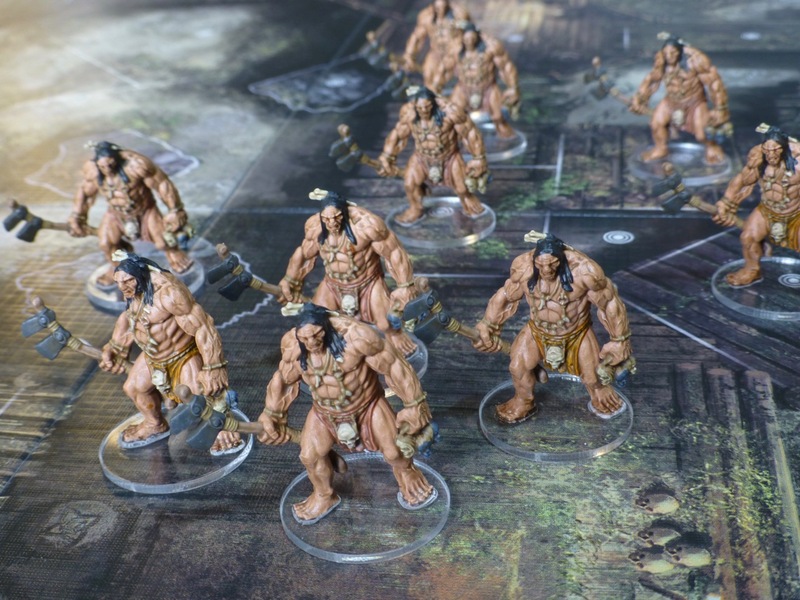 They easily stand up to any wargaming standard. This makes it hard to resist the urge to apply highlights after the shading, add war paint or other flourishes. Those will have to be reserved for the main heroes and villains of the game. The Quickshade is leaving a layer of gloss varnish so it requires a matte coat afterwards. That results in quite a thick layer, but at least the figures will be protected in play and storage. As an additional step I am replacing the round bases that are moulded onto the miniatures with clear perspex. On a 2D game board this blends the figures in nicely. So far, hand injuries have been minor.